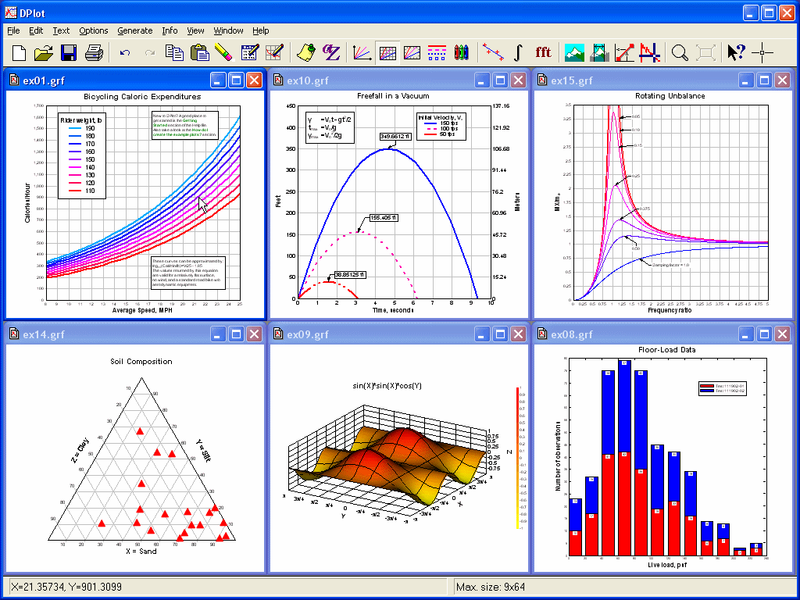 DPlot is a general purpose graphing program designed for scientists, engineers, and students. It features multiple scaling types, including linear, logarithmic, and probability scales, as well as several special purpose XY graphs and contour plots of 3D data. Data can be input via file, copied from the clipboard, generated by an equation within DPlot, sent to DPlot from Excel via the supplied Add-In, or sent to DPlot via dynamic data exchange. Windows 95 or later. 256 or greater desktop color depth. 8Mb free disk space. Manipulation functions include FFT, filtering, and smoothing. Data can be input via file, copied from the clipboard, generated by an equation within DPlot, sent to DPlot from Excel via the supplied Add-In, or sent to DPlot via dynamic data exchange. Source code for example Visual Basic and C demo driver programs are included. DPlot graphs and manipulates 2D and 3D data from a variety of sources in many different formats. While designed for scientists, engineers, and other technical fields, DPlot's straightforward interface will appeal to anybody interested in creating presentation-quality X-Y plots and/or contour plots of 3D data. DPlot runs on Windows 95, 98, 2000, ME, NT, 2003, XP, Vista, and 2008. Qweas is providing links to DPlot 2.3.1.8 as a courtesy, and makes no representations regarding DPlot or any other applications or any information related thereto. Any questions, complaints or claims regarding this application DPlot 2.3.1.8 must be directed to the appropriate software vendor. You may click the publisher link of DPlot on the top of this page to get more details about the vendor.